SAN DIEGO, Jan. 28, 2019 /PRNewswire/ -- Cubic Corporation (NYSE:CUB) today announced it was named a 2019 Best Employer for Diversity by Forbes. In partnership with market research company Statista, Forbes surveyed U.S. employees working for organizations employing at least 1,000 people within their U.S. operations. The second annual list ranks the top 500 U.S. employers that received the most recommendations from survey respondents and have the most diverse boards, executive ranks and proactive diversity and inclusion initiatives. "As a company with a global presence, it's especially important for us to cultivate a diverse and inclusive culture," said Grace Lee, senior vice president, chief human resources and diversity officer, Cubic Corporation. "A diverse and inclusive workplace leads to increased innovation, performance and employee engagement and we are constantly focused on increasing our diversity of thought and experiences to further strengthen our inclusive environment." Respondents were asked to rate their organizations on criteria such as age, gender, ethnicity, disability, sexual orientation equality as well as general diversity. The survey was conducted on companies from all industry sectors, including engineering and manufacturing; aerospace and defense; transportation and logistics; banking and financial services; education; healthcare; as well as IT, Internet, software and services. The survey was administered online and results were calculated using a representative sample of close to 50,000 employees working for companies throughout the U.S. working part- or full-time. 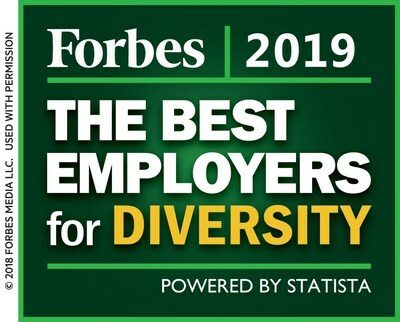 The full list of 2019 Best Employers for Diversity can be found at Forbes.com.